his odour is extremely bad. 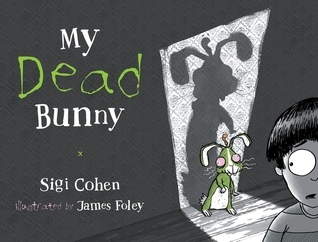 A hilarious rhyming tale about a zombie bunny who comes back to visit his owner. I hated myself for liking the end of the book. It does get funny at the end, but I kinda hated the rest of it. I could not fathom how and why this book had ever been allowed to be made because it is gross and creepy and weird. I don’t understand who would like this book and while I will admit to appreciating the rhyme, and the casual morbidity, I also read it as quickly as possibly because I didn’t want to look at the pictures or read the story for longer than necessary. The story didn’t have a funny tone to it that could make light of anything that was happening, and certainly the dark black pages and eerie green colours didn’t help in the slightest. You certainly wouldn’t read it to a child who had actually lost their rabbit because who would want to deal with those nightmares? But maybe, knowing how kids love the gross and creepy stuff it might have appeal to some of them…I guess. I just can’t stop being perplexed by this book. Why does it exist and why would any one write this, or publish it? I know many people enjoy this, and maybe you need the right tone or humour injected into reading it, but I couldn’t muster up that humour because my own confusion about its existence blocked everything else. I picked it up because I needed to know what it was about, but my goodness, I have no desire to pick it up again.